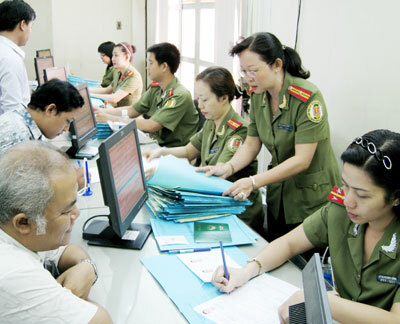 In order to create favorable conditions for foreigners to Viet Nam, the Prime Minister has agreed to abolish the immigration declaration for all passengers when they do procedures of entry and exit at Vietnam's international airports since September 15, 2010. The Immigration Department, Ministry of Public Security has officially announced that: from September 15, 2010, all passengers don’t have to fulfill the immigration declaration form when they do procedures of entry and exit at the border gates which have been equipped with reading-passport machines and networked computers. At the rest border gates will clear the immigration declaration when meet the above conditions. Ministry of Public Security has issued new immigration declaration form in order to apply at the border gates which are managed by the Ministry of National Defense but have not been equipped with reading-passport machines, networked computers. The Prime Minister has also assigned the Ministry of National Defense to preside and coordinate with the Ministry of Finance, Ministry of Public Security to urgently equip reading-passport machines, networked computers and so on for the border gates which are managed by the Ministry of National Defense. In addition, Ministry of Finance has issued its own declaration form according to the management requests when the immigration declaration is cleared at the border gates. Members of the public and incoming passengers have been reminded to comply with the new measure on the quantity of tobacco products that they may bring into Hong Kong since August 1, 2010. (iii) 25 grams of other manufactured tobacco. Incoming passengers bringing in tobacco products in excess of the above exempted quantities should enter the Red Channel to make a declaration to Customs officers. Failure to do so will render the passenger liable to prosecution. Under the Dutiable Commodities Ordinance, an incoming passenger who fails to declare or makes a false or incomplete declaration to a Customs officer on the excessive quantity of dutiable goods in his/her possession commits an offence. The Customs and Excise Department will step up checks on incoming passengers at various control points to prevent abuse of the new measure. The maximum penalty under the Dutiable Commodities Ordinance will be a fine of HK$1 million (about USD 129,000) and imprisonment for two years. The new measure aims at protecting public health by containing tobacco use and encouraging smokers to quit smoking. The public and incoming passengers need to comply with the new law and co-operate with Customs officers when undergoing Customs clearance at the control points. Citizens of China, Bulgaria, Kyrgyzstan, North Korea, and Rumania holding valid ordinary passports for official mission and citizens of 52 countries holding valid diplomatic or official passports are exempt from visa requirements. The duration of staying is stipulated in certain cases. For more information, please visit the website of Ministry of Foreign Affaires. Visa with 30-day validity is exempted for officials from ASEAN secretariat holding many different kinds of passports. Citizens of Sweden, Norway, Denmark, Finland, Japan and South Korea holding different kinds of passports are exempt from visa requirements and are allowed to stay for not more than 15 days. invitations by a Vietnamese competent agencies or tourists in the tours organized by Vietnamese international travel companies. Application files for visa: the entrance application (printed form); two 4x6 cm photos; passport and fee for the visa issuance.